I booked a last minute week's holiday seeking winter sunshine and walking with others and felt immediately at home with the warm welcome shown by Rene and Jesus. The island scenery was breathtaking, the walks were varied and well organised, and the guide and others in the group, all of differing nationalities, were great company. It was a week of constant laughter and banter! Feb 2019 - My second visit to La Gomera and again, Rene and Jesus were perfect hosts. Their walks are well organised and they go out of their way to make you feel welcome and answer any questions you might have on any aspect of the island. They will also arrange your transfer from Tenerife South airport to La Gomera which removes any hassle coordinating the three steps required. You won’t regret booking with this lovely couple. With our lovely guide Vani we explored this beautiful island and it’s diverse landscapes. The weather was perfect for walking. 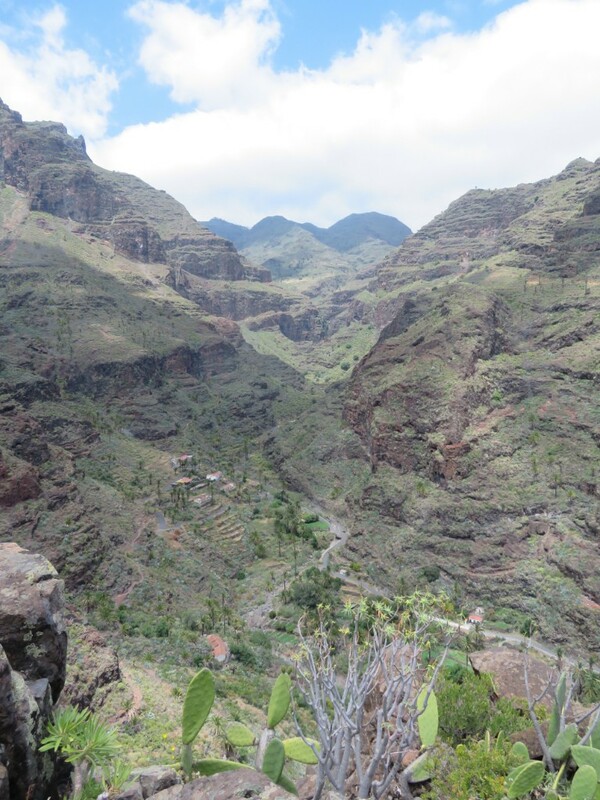 From Vani we learnt about the flora and fauna, the geology, geography and history of La Gomera. His knowledge, enthusiasm and sense of humour made each walk very special. Thank you Vani. The Bella Vista apartments were perfect for us. Clean, comfortable, spacious and very quiet. A very successful holiday. Feb 2018 and my first visit to La Gomera. Jesus and Renee were excellent hosts, both fun and informative on our walks over the week. The transfers and connections they made from Tenerife South to the island and back again were smooth and easy. The island itself is stunning and the walking routes included many of its best vistas. I would definitely book again. Danke für die 2 tollen Tage . Der erste Tag war zum Mirador del Alto de Garajonay. Auf diesem Wege sieht man die umliegenden Inseln und hat einen Eindruck über das abgebrannte Gebiet von 2012. Am zweiten Tag sind wir dann mit Vanni in den Nebelwald. Es war beeindruckend was er uns alles gezeigt hat , Pflanzen und Bäume , die man bei uns nicht findet. Ein sehr romantischer Pfad ,vorbei an einem Bach der ganzjährig Wasser führt ( Lilienbeete, Kiwibüsche und den Madroñobaum, den wir nicht kannten. Eine entspannte Wanderung mit viel Natur und Wissenswertes. Danke Vanni! Danke auch an Jesus für die Einführung in die spezielle Kommunikation der frühen Gomeros. Tolles Erlebnis! Ich kann euch Gomerawalking empfehlen,alles gut organisiert. Back again for the third time - and it met my expectations. Jesus was able to add a lot to the walks in terms of local knowledge...and as for Shiva the dog she was a revelation outlasting all of us in terms of stamina. And yes I do hope to return for another breathtaking trip around this beautiful island. Another great La Gomera week of walks with a social and friendly group. As ever, knowledgeable and well-organised leadership made for a very relaxed and enjoyable holiday. Many, many thanks to Andy, Rene, Jesus and Vannie for their great organisation & relaxed style. We thoroughly enjoyed the very interesting & lovely company of our 12 companions, and not forgetting our little 4 legged friend...Shiva! Really enjoyed the walks, Michaels informative talks and the stretches Agatha did with us. A great weeks walking with a lovely mix of people. Everybody got on well from day one. The weather was perfect and we had a lovely variety of walks. Michael and Agatha took great care of us and Jaime our bus driver brought us on a detour most evenings to show us more sights. We stayed in apartments which were very comfortable with lovely roof terrace. We came back for a third visit with Gomera Walking and it lived up to every expectation. Great organisation, wonderful company on the beautiful walks, comfortable accommodation and hospitable and friendly hosts! A great weeks walking in stunning scenery. Many Thanks to Andy and Paddy for their excellent organisation and leadership on the 'ups and downs' of lovely La Gomera. Another fantastic week walking on LG - this time with Diane. Ticked all the boxes again in terms of hotel, food and hikes. Great craic with group which included a number of Irish! Great holiday. Every detail seen to. Loved the walks, the village, the restaurants , the boat trip on our day off and the accommodation was fine too. Also the bus driver was always prompt and friendly and the organisation to and from the airport and ferry went smoothly. A fantastic week. Excellent organisation throughout, ran like clockwork. A stunning island for walking. It was so good we even walked on our day off using information and maps provided by our guide. Great fun and craic all week. A really terrific week. La Gomera is stunning. Andy and Paddy took us on a varied range of beautiful and interesting walks and the practicalities went like clockwork. A really good group of people to walk with, great weather - can't recommend it highly enough. What a fantastic holiday! Amazing walks on a totally unspoilt island. Brilliant organisation by Andy & Paddy ensured that a wonderful, stress free time was had. And what a lovely bunch of people we had the pleasure of meeting! Muchas gracias! I went on this holiday while 5.5 months pregnant and felt very well looked after. Andy & Paddy were accommodating, encouraging and generous. Thank you for such a lovely experience and your kindness throughout. Great trip, great hiking and great organisation! Andy and Paddy were extremely helpful and went out of their way to ensure we saw the best of La Gomera. We enjoyed it all tremendously! Wonderful scenery, great food in a super hotel, walks to remember and very pleasant company to enjoy. Andy and Paddy are friendly, calm and wise. I recommend this highly as an outdoor holiday. Andy arranged ferry transfers to and from La Gomera, and Hotel Jardin Tecina. Wonderful walks with Andy - he started us off with an easy downhill one. Spring flowers beautiful and temperature of 20C just the tonic! Andy is very amiable company, a knowledgeable guide, and good craic. We will be back! Andy took us on an excellent walk. The walk was well chosen not only being at an appropriate standard but also was in an area that had a number of options. Andy is careful guide and very good company. He showed us other walks in the same area and later in the week we used the bus system and did a second walk shown to us by Andy. Thank you Andy for helping us have such an excellent week. What a grand way to spend a week in winter. Excellent organisation and very sociable throughout. Super transport arrangements and would have no hesitation in recommending this holiday to my friends. We really enjoyed our first guided mountain walking holiday as we thought the scenery was unspoilt and spectacular. The leadership and organisation were excellent and we also enjoyed meeting and walking with such a friendly group. Our thanks to Andy & Paddy. Just back after a wonderful holiday in La Gomera (Jan 21st – 2nd Feb 2014) all organised by Andy & Paddy. From the beginning with prompt emails every aspect of my holiday was organised for me. I walked 6 days with them. Each walk was unique and so enjoyable with great chats and spectacular scenery along the way. You feel your stress dissipate once you step foot onto La Gomera. The Hotel Jardin Tecina where I stayed is a very large and busy hotel yet a great place to relax. Built on the cliff top overlooking the village of Santiago it has spa, gym, pool activities or just chill by the pool. Take a tour of the botanical garden (3hrs) and banana plantation (90 mins) on the grounds of the hotel. The tour with Hans from Hengelo, living in La Gomera for 30 yrs is theatrical and very informative. In the evening in the bar you can listened to the wonderful Danish pianist Anne Tina. I had half board for the first week then B&B for the remainder of my time and ate in the local restaurants. Easy access to the village in a lift from the hotel, activated with your hotel key down 5 floors through the cliff gets you there in 10minutes. Also the restaurant Tagoror across the road from the hotel run by the bubbly Renee was another great place to meet for drinks or to eat. I will definitely be back to La Gomera and is an ideal place for walking holiday. We found arrangements and communication by Andy for our trip to La Gomera were excellent.He organised an Airport pick up and Taxi return Ferry Tickets and Car Hire.He also organised apartments in both San Sebastian and Playa Santiago.The island is incredibly scenic and is a walkers paradise.We only scratched the surface in our 2 weeks.We will return P.G. Thanks again Andy. Thank you so much for arranging such a wonderful holiday. We both thoroughly enjoyed the walking and the company and especially your leadership which really made it such a pleasurable experience. We would like to think we can join you another year. Just back from La Gomera after a wonderful weeks walking. Andy and Paddy are the ideal hosts and your every need is catered for by them.Two very nice and friendly hosts who are also up for the craic. This a unique friendly experience for any walker and I was most impressed by the very smooth running of all of the logistics involved. I will definitely return. Andy and Paddy were extremely helpful in making arrangements for our stay in La Gomera. We appreciated their flexibility in allowing us to join their wonderful walks on an 'as and when' basis. And when it looked as if my privately arranged weekend in the National Park might be impossible due to the unexpected torrential rainfall, Andy and Paddy went above and beyond the call of duty in ensuring that I got where I needed to be. Join this group - you're in safe hands! Had a wonderful time on La Gomera, utterly unspoilt island, and also had the chance to compare it with overdeveloped Tenerife, since I overnighted there on the way in & out. However, don't feel you have to tell everybody, or the secret will get out! Andy & Paddy were great company, and a source not only of local information, but also great craic! They tailored the walks to our ability, so we felt well exercised but not exhausted. Thanks again, and I look forward to returning, hopefully with improved Spanish; a jar's a jara, however you say it! What can we say? This is guided walking with a difference! Andy & Paddy are wonderful company, full of local knowledge, funny stories and great craic. La Gomera is stunning – the scenery is outstanding, the feeling of remoteness total and the weather (usually) stupendous. But it’s Andy and Paddy that make it all really special. If you have been on walking holidays before, this one will beat them all. And if you are a brand new walker it’s a great way to get started. Thank you Andy & Paddy for a wonderful experience. Great walks on a stunning island. Cracking company and leadership. Recommended for all shapes,sizes and ability !!! This being our first visit to La Gomera and not sure what to expect we were absolutely thrilled with our experience. Great scenery, great walking, great accomodation , great food/drink and most of all great fun with Andy&Paddy. Definately planning a return trip! Our first visit to La Gomera. It was wonderful. Scenery breathtaking. The walking and company fantastic. Many thanks to Andy and Paddy. Certainly worth a second visit. Good walking, good company, good food. Gomera walking maybe a small company but it is easily as good as any of the larger companies (if not better). Hope to make a second visit. We cannot speak highly enough of La Gomera Walking. Andy and Paddy were exemplary hosts, always going the 'extra mile' to ensure that all went according to plan. Selection and variety of reataurants proved to be a highlight to look forward to after walking in the mountains. The choice of walking routes provided us with some challenging walks and stunning scenery. Andy and Paddy's local knowledge proved to be invaluable in making the holiday so enjoyable. Definitely worth a second visit. This is the first time we have revisited a holiday experience and we were not disappointed. 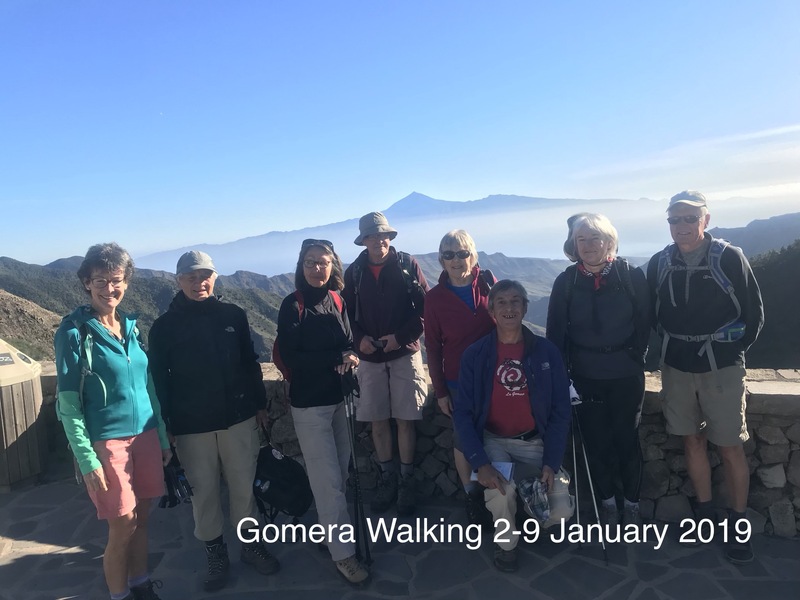 Congratulations to Andy & Paddy for providing such an excellent walking holiday on our second visit to this beautiful stunning environment that is La Gomera. Thank you for your company, we enjoyed the "craic" and the picnics on the hillsides. Good luck for the future. We thoroughly enjoyed our second Gomera walking trip. Affable company, great walks and the tailor made arrangements that you put in place for us. Great to see the landscape regenerating after the fires too. We may return again! We give Gomera Walking 5 Star rating. On our 5 walks we saw some fabulous scenery and gained insight into the variety of walking opportunities on the island. The walks were tailor made to our abilities and superbly organised. Andy and Paddy were instructive,knowledgable and entertaining guides. The walk which ended at a refreshing beach-side bar was particularly memorable. Big thanks to Paddy and Andy for my very enjoyable week in La Gomera, you showed me some stunning spots with breathtaking views and nature. I love the stories (facts) that they provide and the entertainment! =) I see you the next time! We highly recommend La Gomera Walking. Andy and Paddy are gracious hosts, the walking is very doable and enjoyable, and the scenery is stunning. A very well organized, professional and highly recommended holiday. We hope to return.